With only a few months until the fifth centenary of Luther’s Ninety-Five Theses, Christians everywhere are preparing to commemorate the Protestant Reformation. Reflection upon the significance of Luther’s protest, and the larger movement it spawned, will take various shapes and sizes. For example, in the coming days Pope Francis will visit Lund, Sweden to make a pronouncement among members of the Lutheran World Federation. 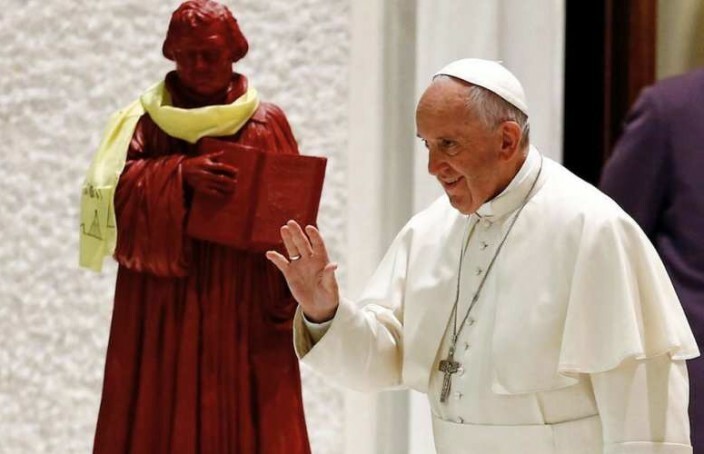 In a lead-up event on October 13, Pope Francis hosted a gathering at the Vatican in which he received a group of 1,000 Lutherans and Catholics from Germany and addressed them from the stage beside a red statue of Luther (photo above). We will keep our eye on that story; in the meantime, however, I would like to consider the significance of the Reformation upon families and local churches. According to The Pew Forum on Religion and Public Life, over 15 million former Catholics in the United States now attend Protestant churches. With a growing Hispanic population, this number promises to grow in coming years. These individuals represent numerous dinner tables over which Protestant and Catholic family members discuss their faith. Despite good intentions, these conversations often crash and burn amidst misunderstanding, stereotypes, and injurious polemics. Can Protestants and Catholics discuss the gospel in a fruitful way, or are the cultural and theological obstacles insurmountable? Married couples in which one is a Catholic and the other a Protestant have even more basic problems. Which church they will attend? Will their children participate in the Protestant youth group or the Catholic Church’s equivalent? What about the sacraments of Holy Communion or Confirmation? Is it advisable or acceptable for these parents to permit their children to observe religious ceremonies across the Catholic/Protestant divide, even ones with which they earnestly disagree? Does affirmation of this kind constitute loving support or negligent compromise? Dilemmas such as these ultimately come down to a stark issue: To what extent do Catholics and Protestants recognize one another as brothers and sisters in the same apostolic faith? If a person’s position on this issue can determine the course of conversation, how much more will it determine the relationship between church bodies? Some Protestant groups and churches operate according to the assumption that fidelity to the gospel requires them to be explicitly anti-Catholic. Collaboration on social issues (e.g., sanctity of life, protecting children, caring for the elderly) is dismissed out of hand, for to collaborate would be to compromise the gospel. The way we assess and navigate these personal dilemmas, practical problems, and institutional questions are, whether we intend it or not, a statement on the status and relevance of the Reformation. The opportunity before families and churches over the next year of commemoration (and beyond) will be to uphold theological integrity, particularly on the questions of Christian authority and justification, while maintaining a manifestly Christian ethic toward Catholic friends and loves ones, that is, relating to them with the kindness of Christ. We therefore remember the grace of the gospel by which evangelicals define themselves–to be embodied with integrity–ought to find expression in our gracious manner. Thus to avoid sounding like a noisy gong or clanging symbol we dedicate ourselves to embodying the gospel with Christian gentleness, that is, in Paul’s words, speaking the truth in love. Portions of this post are taken from my new book, co-written with Gregg Allison, The Unfinished Reformation: What Unites and Divides Catholics and Protestants After 500 Years. The Pew Forum on Religion and Public Life, “Faith in Flux: Changes in Religious Affiliation in the U.S. (Executive Summary, April 2009, rev. 2011),” Pew Research Center, http://pewforum.org/Faith-in-Flux.aspx.